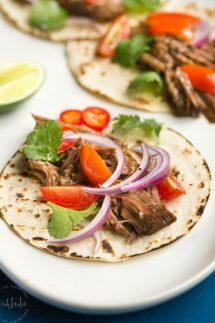 My Pressure Cooker Barbacoa will melt in your mouth, it really is that good! It’s so easy to cook in your pressure cooker and requires no advanced cooking skills but the finished dish tastes like you’ve been standing over it on the stove all day long. 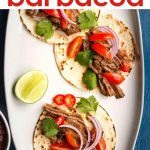 I’ve made my pressure cooker barbacoa several times in the last few weeks, it has such a fantastic flavor and my kids and husband were asking for seconds! If you have time I highly recommend serving it with my Instant Pot Cilantro Lime Rice, they are made for each other. The best cut of meat for making pressure cooker Barbacoa is beef chuck roast. It has good fat marbling and will be fall apart tender when cooked, leaner beef roasts tend to dry out. Adjust the heat by using two chipotles for a milder version, and use three to four chilis if you want it a little hotter. 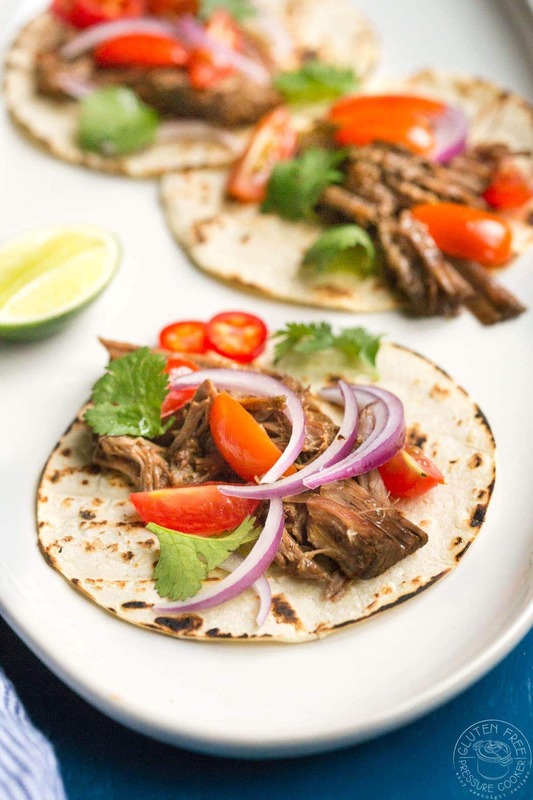 Traditionally Barbacoa is made with lamb or goat and then wrapped in maguey leaves. However, here in the USA it’s often made with beef cheeks and slowly cooked over an open fire pit. As beef cheeks and goat are not easy to come by, and good cuts of lamb are expensive, I’ve used beef chuck roast instead as it’s easy to find and will make fall apart Instant Pot Barbacoa you’ll love! Carnitas is simply pork shoulder that’s been slow cooked with herbs and garlic, then shredded and broiled until a little crispy. You can make tacos, salads and all manner of tasty recipes with it. The traditional way to eat Barbacoa is on top of corn tortillas with guacamole, salsa, onions and cilantro. 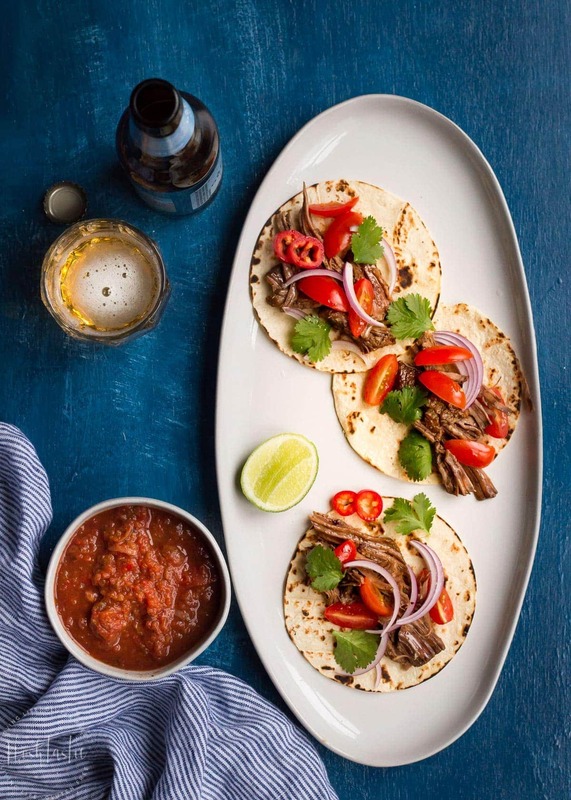 I love to eat it with a little chopped red onion as I think it works really well with the barbacoa flavors but basically any kinds of taco fixings that your family loves will work well. As I mentioned above I think it works really well with my Instant Pot Cilantro Lime Rice, the flavors work very well together. Instant Pot – I have a couple of pressure cookers but my Instant Pot Duo is my favorite. Cutting Boards – I love these cutting boards as I can rinse them off and put them straight into the dishwasher when I’m done. Brown the chuck roast on both sides, you can use the saute or browning function in your electric pressure cooker for this or just use a large skillet if it's a too big to fit on the bottom of your Instant Pot. Add the browned beef chuck roast to your pressure cooker or Instant pot and cover in the sauce, and add the bay leaves. Lock the lid, turn the steam release vent to 'sealing' and using the 'manual' or 'pressure cook' setting, adjust it to cook for 55 minutes at High Pressure. When the cook time time is up, allow the unit to reduce pressure on its own without opening the steam release vent (Natural Release) for 15 minutes, then release the remaining pressure and open the lid. Check the meat, if it's not tender enough for your liking simply put the lid back on and cook for another 10-15 minutes. Pull the meat apart into the sauce and serve with tacos or over a bowl of Instant Pot Cilantro Lime rice. what is in it that makes the potassium so high? Hi Roxy, I’m honestly not sure, it’s all calculated automatically and I’m not familiar enough with potassium to know in what foods it’s most commonly found. When do I add the bay leaves? Hi John, thanks for catching that, I just updated the recipe. You can add them along with the sauce and the meat when you are going to pressure cook it.